Ham and Lentil Soup is quick and easy since it’s cooked in the slow cooker. Hands-on time is about 15 minutes, and the end result is a rich and hearty soup that everyone will love. If there’s a good meaty ham bone sitting around from a recent dinner of spiral-cut ham, this is a perfect way to use it. However, leftover diced ham is great too. As the weather turns cold, this soup will be a welcoming and warming dish. Lentils cook faster than some of the other dried beans that are available, and they are very low in fat; they have virtually no cholesterol and no sodium. They are a good source of Protein, Iron, Phosphorus, Copper, Folate, and Manganese. Lentils are also very high in fiber; in fact, 1 serving of this soup supplies 25% of daily needed fiber. 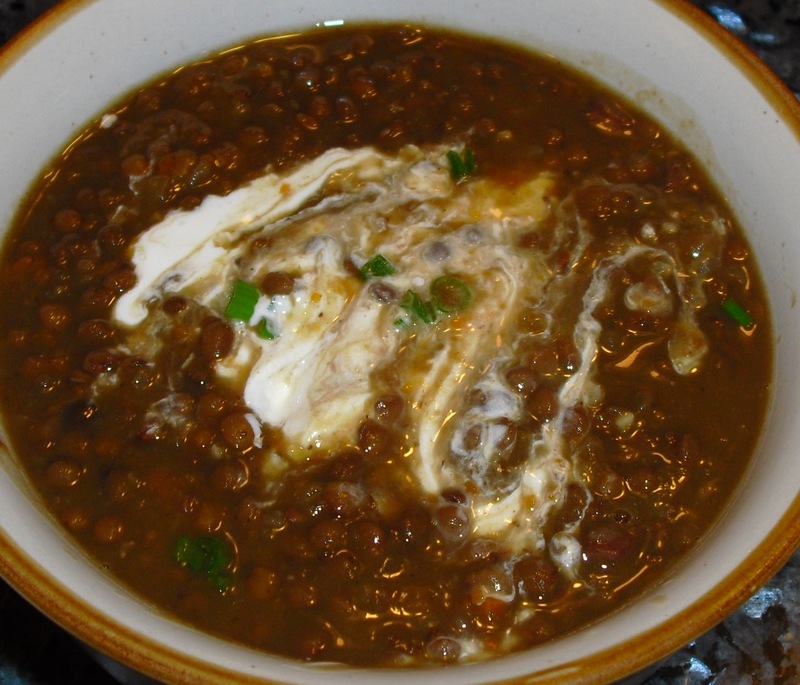 The best part, of course, is that lentils taste good, especially in this soup. Ham bouillon is best in this soup, but sometimes it’s hard to find. If it isn’t at the local grocery store, look for it at a restaurant supply store or gourmet food store. Feel free to substitute chicken, beef, pork, or vegetable bouillon. Place the lentils, water, bouillon, carrots, garlic, onion, celery, ham or ham bone, and bay leaves in the crock of a 5-6 quart slow cooker. Turn to low and cook 4-6 hours or until the lentils are tender. If using a ham bone, remove it and chop any meat; add the meat back to the soup. Taste for seasoning; add salt and freshly ground pepper to taste. To serve, stir in a spoonful of sour cream and sprinkle with a little chopped green onion or chives.